Charles Matthews: I'll admit to becoming in a minor way distraught, once in a while, at the prevalence of sanrensei and Chinese fuseki talk when it comes to opening theory discussion. This can be both a matter of taste - I don't play either type of opening myself at all frequently - and slightly irrational on my part. I call these 'high-concept' openings by analogy with the Hollywood 'high-concept' film, where the plot has to be easily understood by a seven-year-old. So the first comment I have is that 'go isn't like that'. To qualify that a little: you can't win simply by playing on one side of the board. A fifty-point side isn't enough to win. No, really, it isn't: you may think that playing five stones on one side and taking 57 points is great, but your positional judgement is then wrong. A somewhat more sophisticated version of the same story is that these are omoyo strategies. Black sets out to expand from one side of the board into such a large-scale framework that White cannot cope. This way of looking at it has more substance. If Black and White play for competing frameworks, Black has the advantage because Black starts, That's undeniable. White has komi, though. Therefore in a sense Black must play on a larger scale than White, if the board is simply dividing into two huge competing areas. Relying on one framework is called ippoji and it's wrong-headed. No, really, you may be reading this and thinking 'the man has never heard of Takemiya'. There's only one Takemiya - accept no substitutes. I have met Takemiya and the man is talented. J.S. Bach didn't need to read books on harmony, Takemiya doesn't need to be told that a large-scale strategy isn't a robust plan unless it has something innately a bit special about it. You do realise that White can choose a formation that makes sanrensei by Black not a great opening? You do realise that the techniques for playing inside a sanrensei framework are really just 'normal middlegame joseki'? Aren't you glad when your opponent plays an ippoji strategy that is more intimidating than sound? It's perfectly true that some players will make a sanrensei or Chinese formation out of obstinacy even when it's not a perfect choice, by pro standards. It's quite true that, last time I looked at the Go Teaching Ladder games, a high proportion did adopt one of the said openings; and opening books in English don't cover so much else. In a martial art, it seems to me, this all would be assuming that there isn't a way to side-step a well-telegraphed and very committal attack. I find that hard to believe. As I said before, my feeling for go is that it isn't like that. Bill: Mild dissenting comment. 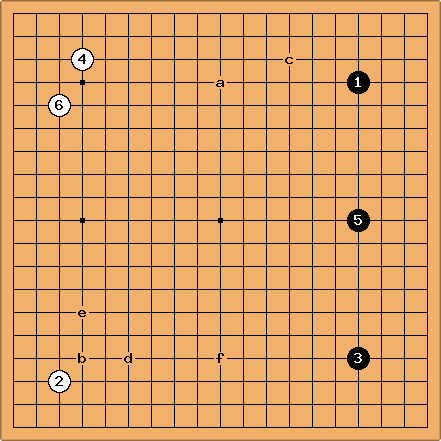 In reading some of Go Seigen's recent books, I have been struck by how often he appeals to the idea of Black's playing in a way that is easy to understand. If it were anybody but Go Seigen, I might think, "Well, he's an old man living in the pre-komi past." But who understands go better than he? Anyway, I think that sanrensei and the Chinese openings fall into the easy for Black to understand category. Charles: Didn't mean that Go Seigen wanted to play them, of course - a nirensei man for 25 years. Those books are some of the best fuseki material of recent times; in comparison the new Kato book on the Chinese seems a disappointment. There are some good volumes put out by Ai Books, for example those by Otake in a pair 'Fuseki with Black', 'Fuseki with White', and the examples in the first of those give a much richer diet. Tamsin: Sorry, Charles, but as a musicologist I cannot resist pointing out that J. S. Bach did read books on harmony, in the sense that he spent huge amounts of time copying and studying works by other composers, and his education would also have included reading musicae poeticae (compositional treatises). But the point you made stands: like Bach, Takemiya must not only have spent hour upon hour studying the basics, but also has an immense natural understanding that helps him to find exceptions and new ways of looking at things. We can study hard, but there's no substitute for that kind of innate ability, which is why Takemiya's omoyo strategies work so much better than mine. Charles: Yes, interesting if he did when he didn't have to. Europeans don't actually have a stereotype of 'traditional master', I think - it's all got overlaid with myths about Romantic-period geniuses, scientists making headline-grabbing breakthroughs, and so on. Tamsin: Hmm, I was thinking on the lines that even when you have enormous talent for something, you still need to learn how to use it. Bach couldn't write good harmony before he encountered examples of it; people don't pop out of the womb with perfect pitch (not actually a genuine sign of musical talent, but that's by-the-by), but have to hear each tone and learn its name, even if that takes place so early on that they cannot recall this learning process; even go professionals start off weak, before they are shown the way by their teachers (you can find online numerous games by a younger, weaker Takemiya in which he loses while holding several stones' handicap). Arieh: This isn't quite true. There are rare geniuses who require no formal training to reach the top of their fields. One example is Ramanujan who re-discovered many centuries of math with no training whatsoever. He did have a few introductory textbooks, so I suppose you could argue that even these rare geniuses need some introduction to the material. Another fun example is Shel Silverstein who didn't read or study poetry until he was around 30. Frequently the most innovative and revolutionary thinkers have little exposure to common wisdom, either by choice or accident. They succeed not in spite of, but at least partly because of this. A common saying is that if you haven't had your big idea by 30 in physics, you never will. Most great discoveries are by 22-28 year olds. People who had learned just enough to do good work but not enough to stop asking the stupid questions. And yes, there are plenty of exceptions of 40 and 70 year olds making great discoveries too, but the revolutionary ideas belong overwhelmingly to the young and foolish. BobMcGuigan: I think Takemiya's play with White is more admired by other pros than his san-ren-sei play with Black. 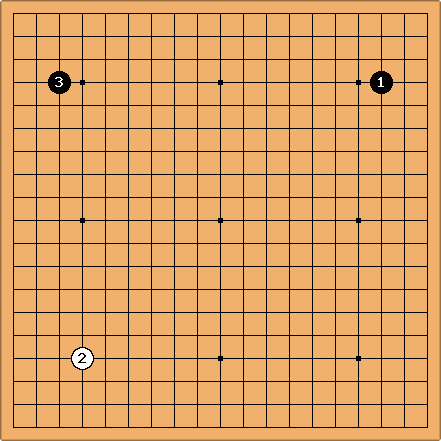 I know amateur players who almost always play san-ren-sei or Chinese style with Black and admit that they don't really understand how to handle a game in which there is no large moyo. Charles: Yes, this has been said by Otake, and probably is a commonplace for pros. A big difference to my mind, as I've posted before, between amateurs who think they can play like Takemiya, and pros who know they can't. Dieter: How about the difference between amateurs who don't play like Takemiya, thinking they know what distinguishes them from the cosmic knight, and pros who don't either but who know why ? HolIgor: There is a belt of players on IGS who like to play one-sided fuseki. These players are about 4k-2k in rating. I believe these are people that understand these particular openings that concentrate on one side of the board (such as the san-ren-sei and the Chinese) but have not grasped other possible opening strategies. But as the players become stronger the choice of opening strategies becomes move diverse. In fact, only those who can successfully overcome the one-sided openings are promoted to the higher ranks. Of course, better players also play san-ren-sei or Chinese fuseki from time to time are part of a larger repertoire of opening strategies. kokiri: It always seems a shame to me to limit oneself to a few openings at the start of a Go game. 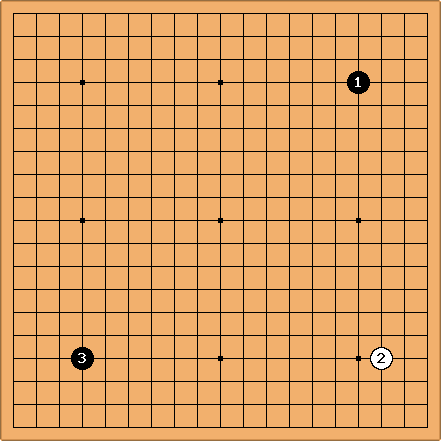 One of the beauties of the game, to me, is the empty board, and the range of variety that it implies. However, maybe a consistent opening strategy would lead to better results. This would obviously be a concern to professionals (who get paid through winning) but also maybe to people looking to improve their rank. As to why people play the sanrensei and Chinese fuseki, I guess it's only natural for people to copy professionals; it's just a shame we're no longer in the shinfuseki era. dnerra: I have some agreement and some disagreement. I think it is useful to try to play an opening where one thinks one understands its concept (even if one doesn't). Maybe then one can understand better where it went wrong. But I agree that limiting oneself to one-sided openings is neither fun nor good for long-term improvement. I once got an advice from a 6 dan that I still like very much: he said one should try to consistently use one opening for a couple of months. Then one will understand better what is happening, and generally draw more benefits from the analysis. Of course, it's both fun and instructive to add to this some database search and compare how the pros played similar situations. Or maybe pick one of the side formations explained in Charles' articles on gobase.org, and play it whenever you have the chance to it. And remember that you are not doing this to be better prepared than your opponent for this specific opening (or similar chess thinking), but to understand this opening better. Naustin: I recently got dissatisfied with losing and not being able to figure out why. I decided my play was too random so I spent a lot of effort (for me) studying opening ideas through the very first few stones in the game. Parallel or cross fuseki and gradually decided on an opening I liked the look of though I couldn't prove it was good or anything. I learned some about the history of it and did some searches on gobase. The result was that I went on a winning streak that increased my rank by 2k on KGS when I had been on a slide even lower. I don't want to only know this fuseki but it gives me a starting point. I can work on this for a while and then I will be able to try new things and hopefully understand what differences the opening makes because I have something to build on. BobMcGuigan: Kato Masao, certainly a great player, specialized his opening play during his early career. He would play one specific opening (e.g. san-ren-sei, Chinese style, 3-3) exclusively until he felt he had mastered it and then move on to something else. This approach has something to be said for it, certainly, especially if you have well thought out goals to achieve so you know when to move on and you do move on so you develop a balanced understanding. Helcio Alexandre: I like to play each game as it is a new one. In the fuseki I usually try to apply basic concepts like corner, side, center, balance of 3th and 4th line, create strong and healthy groups to fight and make all stones work together. I used to play San Ren Sei when I didn't understand anything else. I said to myself: I don't understant komoku or other stuff so I'll just play this simple stuff and hope that my opponent makes an invasion in my moyo. But I do feel that San Ren Sei is sound. I'm also a chess player, and in chess there is also this openings that are not so strong, but are easy to play. You usually don't get the most that you can, but the strong point is that you play a position that you usually understand better than your opponent. Of course, nearly 99% of kyu players that I see playing SRS doesn't have any idea of what it is about. SnotNose: This discussion is typical of many Go-related discussions in that many statements seem to imply that "this is not the right way to play Go" or "people who play this way don't know what they're doing." In some narrow sense there may be a degree of truth to these sentiments, but I think something is missing (here and on many other SL pages). First, one should define what one's goals are with respect to Go and what one's audience is for the topic (beginner vs. advanced is far too coarse for this--not to mention the distinction seems to be ignored here). Is the goal to "win more Go games" or "to understand the game better" or what? Is the content for those who "consider themselves expert at the san-ren-sei" or "who play the san-ren-sei regardless of opponent's moves" or what? If one's goal is to learn the virtues and limitations of of the san-ren-sei, what better way to do so than to play it exclusively for some time? Moreover, while the san-ren-sei, or any other set pattern, can be demonstrated as suboptimal in the face of certain play by White, and this suboptimality can be exploited by pros, what does that have to do with amateur (and kyu) play? It isn't at all clear to me that distinctions evident to pros or dans matter at all to kyus. If improvement is one's goal, than these distinctions need to be recognized by kyus some day, but, perhaps, today is not the day. Put another way, a kyu (or maybe even dan) deciding not to follow a familiar pattern because someone stronger wouldn't doesn't necessarily help the kyu learn or win. At the very least, it does encourage the kyu to question his goals and approach, which is fine. If that is the point, then I encourge us to be explicit about it. Does dan dogma or pro progaganda help anyone learn? (I think yes, but with limitations.) I'm curious what folks think (what are the limitations? what is the responsibility of the weaker player? how skeptical should one be?). In a sense, this may be the close to the same idea that sparked Charles' original post on this topic. He may be reacting to statements made by strong players about the automatic adequacy of san-ren-sei or Chinese openning. The subtitle of Kato Masao's book is "a sure win strategy" (or something similar) (which is nonsense) and the early pages of The Power of The Star Point encourage the reader to ignore White's play and set up the san-ren-sei (probably fine for the audience, but not to be taken too far). Charles: That's some of it. I was pretty fed up that the new Kato book on the Chinese, from the Nihon Ki-in, seemed almost entirely to be based in Japanese games from a little while ago - no attempt to make a 'theory', using Korean and Chinese stuff. So I think it's all about selling books, not doing the research and informing people. Not only catchpenny on the first few pages, but hack work through and through. Well, if my Japanese were better I might find it a good read; but I'm still out of sympathy. BobMcGuigan: A lot of Go books in Japan are potboilers, unfortunately. I imagine there is just as much of a "fan" culture among amateur go players in Japan (and other countries) as there is among sports afficionados in Western countries. A lot of people will buy the latest book by the new Honinbo title holder and it will go on the shelf to gather dust. I can't blame the top pros, they have to make their money while they're at the top, and they probably don't have the time (or maybe the expository skill) to produce the sort of deep conceptual tract we would like to have from them. They express their ideas on Go via their play in their games and, perhaps, in their commentaries on other games. Thus I think there is value in statistical analysis of large collections of pro games because it may show things that even the pros themselves might not be able to articulate. dalf: I'm only 15k, but I don't understand what is the problem here. If people consistently play san-ren-sei, the worst they can get, is to get rated 1 or 2 stones below their current ability ; but then, they would be a 2 kyu Takemiya instead of a 1 dan versatile player. This is the same thing as if you always played your first move at the 1-1 point no matter what (the horror! ), and all what you'll get is to be one stone weaker. It is influence oriented, and I felt I didn't understand influence in even games well. It is similar to handicap go, and what little I know of joseki is invested in the starpoint. Few of my local peers play it, and so it is nice to challenge them with something new. What I'd like to hear from stronger players is which fuseki to jump to next? I'd like to diverge greatly (ie: not the Chinese Opening, which seems too similar). My goal is to see the contrast between a moyo/influence oriented fuseki (ie: sanrensei) and the next fuseki I study. I think this would give me a better understanding of how fuseki affects the rest of the game. White now has 20 certain points on the board, plus komi, conservatively, lets say White has 25 points total. So far, Black has zero points (but a lot of influence of course). Can Black's next move be worth 25 points? If not, then Black should have played kakari around instead of playing . On the other hand, if the high-concept opening is not a myth, then maybe Black continues philosphically from the san ren sei by playing at a and then black still has zero points on the board. Would you rather have White or Black in this position? Bill: I kind of like d, followed by f if White plays e or thereabouts.